Just mere steps away from last week’s stop sits The Pour House in Collingswood, another great craft beer bar in South Jersey. They’ve got a plethora of burgers to choose from – 14 to be exact – including their winning burger from the 2013 Battle of the Burger, “The Second Coming“. I almost couldn’t decide which burger I wanted because they all sounded great, but I finally settled on the pretzel burger since I’m a sucker for pretzel buns. 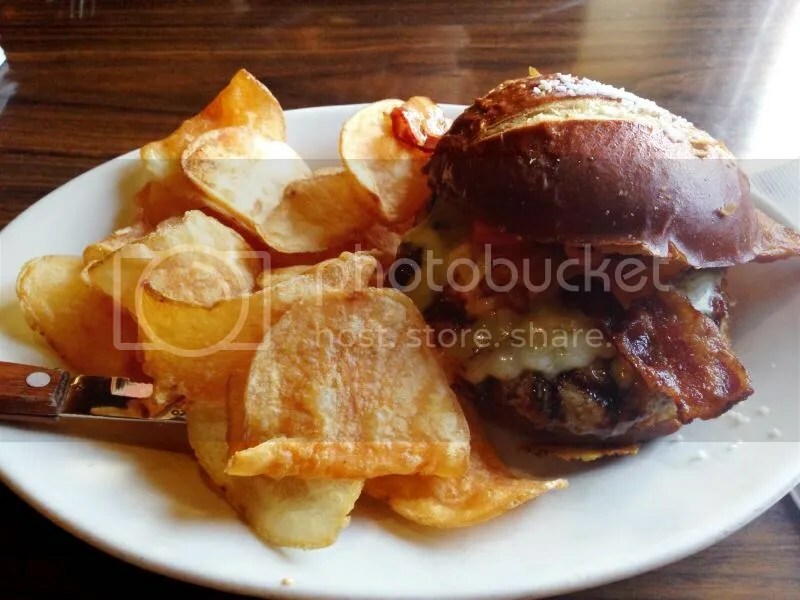 The burger comes topped with Vermont white cheddar, sherry onions, chipotle aioli, and bacon. The burger came out cooked medium as requested, but was extremely juicy and had lots of runoff. Luckily that pretzel bun soaked up a lot of the juices without getting a soggy bottom bun. There was a perfect burger to bun ratio and the bacon was nice and crispy. I loved the flavor of the sherry onions since I’m also a sucker for any kind of caramelized onions on a burger. And of course, the Pièce de résistance: that buttery, salty, delicious pretzel bun. One burger down, 13 more to go! Posted in bacon, buns, burger, burgers, Collingswood, Jersey, onions, pretzel, pretzel bun, The Pour House. Bookmark the permalink.